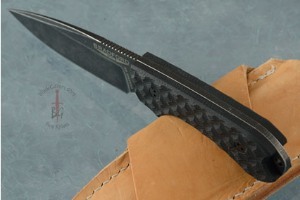 Cutting edge length: 3.20 in. The Bradford Guardian3 is a compact fixed blade that is designed to handle the work load that might typically fall upon a heavy duty everyday folder. This sprint run of the Guardian 3 uses Uddeholm Vanadis 4 Extra SuperClean tool steel. Vanadis 4E is a powder metallurgical cold work tool steel produced by Bohler in Austria. This steel is known for providing a combination of high wear and chipping resistance. This makes it particularly useful for heavier tasks where chipping is likely to be the failing point, but high wear resistance is still needed. 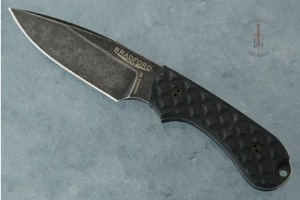 The blade has a Nimbus finish with a false edge grind. To create the Nimbus finish, Brad coated the blade with a DLC coating then tumbled the blade the same way the stonewash finish is created. 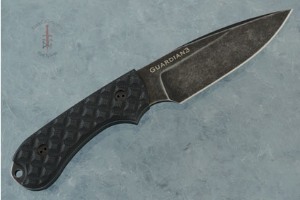 Black G10 scales are diamond textured to offer a secure grip without being abrasive. The handle fills out the hand comfortably. A tapped hole at the end of the handle makes it easy to add a lanyard. 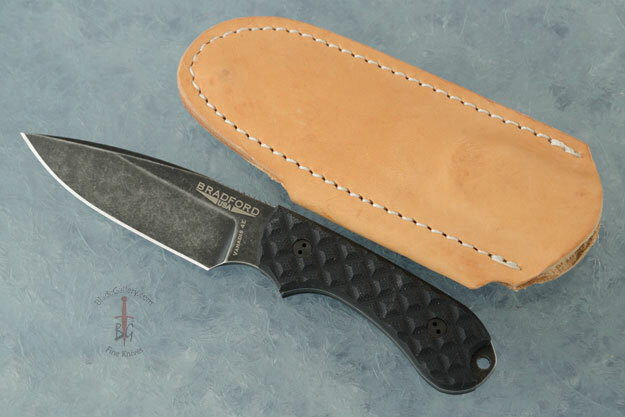 The knife is accompanied by a premium pouch style leather sheath with belt loop and plastic blade insert. 0.0927734375 0.03076171875 92.7734375 30.76171875 Trailer Started. 0.18701171875 0.09423828125 187.01171875 94.23828125 Trailer Completed.